SageGlass dynamic glass controls sunlight to create a comfortable, productive learning environment and collaborative event space. 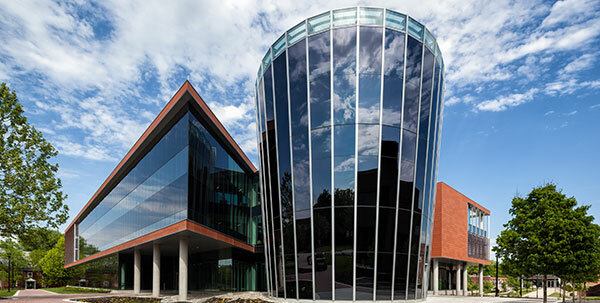 SageGlass®, manufacturer of the world’s smartest electrochromic glass, announced the completed installation of 25,000 square feet of dynamic glass at the new Center for Natural Sciences, Mathematics and Nursing at Bowie State University on portions of the curtain wall façade and throughout “The Beacon,” a three-story multipurpose space. SageGlass dynamically controls sunlight to provide students and faculty with a comfortable learning environment and collaborative event space. The project is aiming to achieve Leadership in Energy and Environmental Design (LEED) Gold certification from the U.S. Green Building Council. By controlling sunlight to optimize daylight, outdoor views and comfort while preventing glare, fading and overheating, SageGlass creates a more comfortable, productive learning environment conducive to cognitive thinking, thanks to unobstructed views of the outdoors. The dynamic glass tints on-demand, allowing professors to customize solar control. It also tints automatically via light standards. By blocking sunlight on hot days, SageGlass will help dramatically reduce energy demand in the building. The 149,000-square-foot facility features flexible classrooms, state-of-the-art research and instructional laboratories, and a natural sciences greenhouse to foster collaboration across academic programs and support the University’s strategic initiative to enhance teaching in the sciences and cutting-edge research. The Center will also include a nursing simulation wing and increase the University’s capacity to enroll nursing students. Bowie State University completed this project in partnership with the University of Maryland Service Center, Perkins + Will, and Clark Construction. SageGlass® is the pioneer of the world’s smartest electrochromic glass and is transforming the indoor experience for people by connecting the built and natural environments. Electronically tintable SageGlass, a product of Saint-Gobain, dynamically optimizes daylight and manages temperature – all while maintaining unobstructed views of the outdoors. With SageGlass, building occupants can comfortably experience the biophilic benefits of the outdoors, including stress reduction, enhanced creativity and an improved sense of wellbeing. SageGlass allows architects to elegantly solve solar control challenges without sacrificing aesthetics and design. As a wholly owned subsidiary of Saint-Gobain, SageGlass is backed by 350 years of building science expertise that only the world leader in sustainable environments can provide. Visit www.SageGlass.com, @Sage_Glass and Facebook.com/SageGlass.